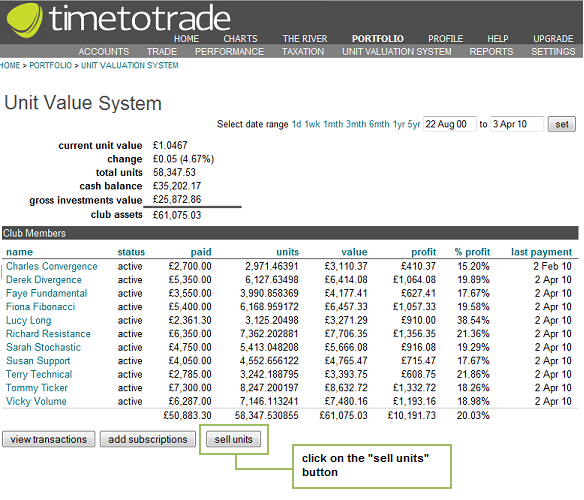 This help section discusses how to manage member withdrawals, through the sale of units, using the 'sell units' button. The 'sell units' button on the 'UVS' tab, provides a simple wizard that enables you to quickly manage unit sale transactions. 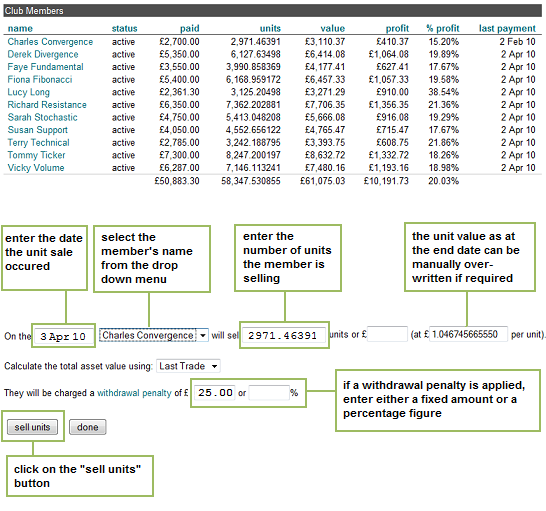 Please note that when working with Unit Valuations on the 'uvs' tab, it is important to remember that the selected 'end date' determines the displayed unit value as well as the unit value used when selling units using the 'sell units' wizard. It is therefore very important that the 'end date' is chosen correctly. In the following step-by-step example, we are going to consider a scenario that requires the sale of units to facilitate the withdrawal of money by a club member. Let us assume that on the 3rd April 2010, "Charles Convergence" decides to leave his investment club and sell all of his units. The club agree to Charles selling his units using the unit value on the 3rd April 2010, however as the club has to sell some shares to raise the money to pay Charles, to cover the trading commissions associated with selling the shares the club decide to charge Charles a £25 withdrawal penalty. Whenever you work with unit transactions, it is important that you firstly set the 'end date' to the date the unit transactions occurred; in doing so the correct unit value will be displayed when entering the unit sale information. 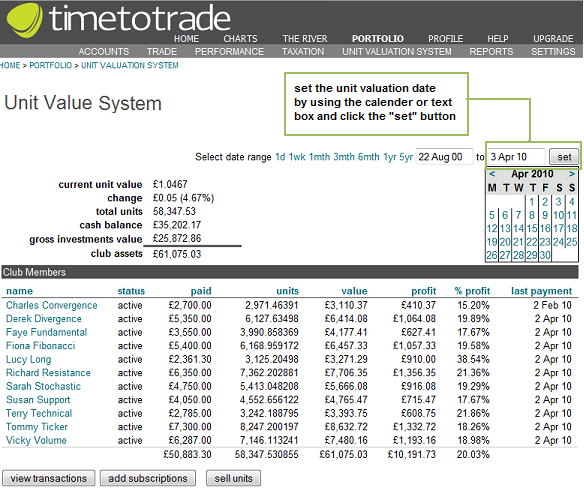 In this example we are going to set the 'end date' to the 3rd April 2010 (3 Apr 10) as displayed in the screen shot below. To change the 'end date', click on the date field and either use the drop down calender to select a date, or manually enter a date using the displayed format. When you are finished, click on the 'set' button. Alternatively you can use the 'add/edit' button to sell units as discussed in the "How to add individual unit transactions" help section. After clicking on the 'unit sale' button the member withdrawal wizard should appear. In the first field on the top row, enter the date when the club member was paid from the club's bank or broker account. After entering the date, select the club member's name from the drop down menu. You now have the option to either enter the number of units that you wish to sell or to enter a fixed cash amount that the club member wishes to withdraw. Lastly, you have the option of applying a Withdrawal Penalty by either entering a fix amount of cash or a percentage figure. In this example Charles Convergence wishes to withdraw all his funds from the club account. He is paid out on the 3rd April. As he is withdrawaing all of his funds from the club, this is input as a sale of his entire unit holding of 2,971.46391 units. The units have a value of £1.04674566550 per unit on the 3rd April (the unit value figure is automatically calculated by the software based on the asset value and total club units as at the end-date; you can manually over-write this figure if so required). In this example we will also include a penalty charge of £25 on withdrawal, to cover the cost of trading commissions for instance. When you have finished entering all of the necessary information, click on the "sell units" button. You will see that Charles now owns nil units and the number of units in the club has reduced from 58,347.53 to 55,376.07, reflecting the sale of Charles' 2,971.46391 units. 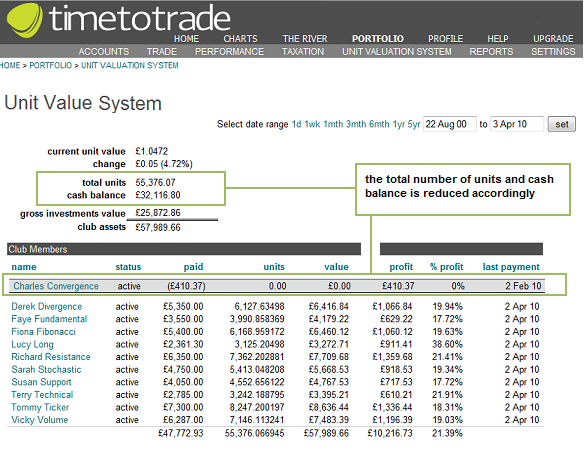 Charles has been paid a total of £3,085.37 (ie his £3,110.37 fund value less the £25.00 withdrawal penalty). The total asset value in the club has reduced by £3,085.37 accordingly, from £61,075.03 to £57,989.66. DO NOT remove the club member from the club. HMRC require that history of the the ex-club members' accounts and unit transactions are retained.